Major CHARLES MEREDITH BOUVERIE CHAPMAN MC 29th Sqdn., Royal Flying Corps and The Buffs (East Kent Regiment) who died on Monday 1 October 1917. Age 25. Major CHARLES MEREDITH BOUVERIE CHAPMAN MC 29th Sqdn., Royal Flying Corps and The Buffs (East Kent Regiment) who died on Monday 1 October 1917. Age 25. Chevalier of the Order of Leopold and Croix de Guerre (Belgium). 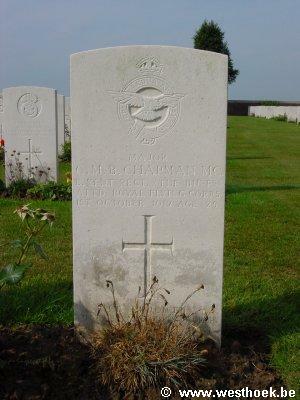 Son of William C. N. and Maud Chapman, of Heppington, Canterbury. MENDINGHEM MILITARY CEMETERY Grave VI. B. I.